BISHOP BONNY has given interviews and co-authord a book. 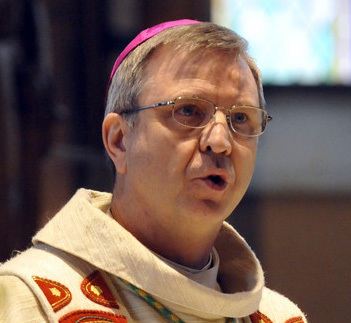 BISHOP Johan Bonny of Antwerp, Belgium, has called for ecclesiastical recognition of gay relationships, according to an interview published in De Morgen, a Belgian newspaper, on Dec. 27, 2014. The official teaching that the Catholic church can recognize only male-female committed relationships has to change, Bonny said. Bonny said the open-minded spirit and pastoral focus of Pope Francis have given him the courage to speak out about issues that are important and pressing for today’s believers. Will the church at some point give its blessing for gay and lesbian couples? Bonny stressed that the man-woman relationship has a special place in the Christian tradition. “MAY I? THANK YOU. SORRY. BISHOP Bonny offers his thoughts in a book . . . published October 11 by Flemish editor Lannoo under the title May I? Thank you. Sorry, an obvious quote from Pope Francis’ frequent talks to married couples. [e.g. 2016_7-09_Krakow]. While Bonny offers an open dialogue about relationships, marriage and family, his most [controversial] proposals in the book have already been presented to the Dutch-speaking public by the Catholic Church’s official weekly in Flanders, Kerk & Leven. The magazine’s editor-in-chief, Luc Vanmaercke, described the book as a response to the Pope’s call during the two Synods for the Church to take a more contemporary view of society.